Electric utilities and other power networks are in a unique position when it comes to improving sustainability. That’s because they have the ability to not just control their own carbon footprint but also promote more efficient, sustainable energy use for consumers. They can improve sustainability and decarbonize to mitigate climate change while still supporting their consumers’ growing needs ranging from smooth, efficient integration of electric vehicles into the grid to better energy accessibility. There is impressive growth in electric vehicle (EV) use as consumers seek greener, emission-free transportation. In 2016, there were record-breaking sales of EVs worldwide, and that growth is expected to continue. Some predict that one in six new cars in the world will be electric by 2025. How will this explosion in EV popularity benefit utilities? It’s a huge opportunity because EVs need charging stations and other essential power infrastructure and will depend on utilities to provide energy from renewable power sources and maximize off-peak charging energy use. Because of these needs, EVs will contribute to an efficient, cleaner, digitized energy system and infrastructure that is customer-centric while also furthering utilities’ climate change goals. Utilities are also focusing on a different sustainability challenge—how to decarbonize energy while expanding electrification and promoting efficiency in developing and rural regions of the world. In many regions, microgrids and clean, low-carbon power sources like solar, are the most practical power options—and the most sustainable. Digital technology plays a key role in the solutions for new energy world problems because a smarter, data-centered grid allows better use of renewable resources and improves overall grid performance. Distributed energy resources (DER) like solar and wind continue to gain strength and popularity—BNEF predicts that solar and wind will dominate the future of electricity, with 72% of the $10.2 trillion spent on new power generation worldwide to 2040 being invested in new wind and solar PV plants. But to optimize grid assets today, utilities must push the current boundaries of these sources of power. This requires a data-focused infrastructure that gives utilities flexibility and control capabilities and an understanding of real-time grid conditions. Digitization makes a major sustainability impact by optimizing grid operations and integrating IoT, IT, and OT systems. It’s clear that the explosion of EV and DER onto the electrical grid requires more sophisticated distribution utility operating systems. They’ll need real time operations and control to thrive within a more dynamic power distribution marketplace than we have ever seen. To stay competitive, utilities also need to rethink their business models. The future is low carbon and there are many advantages to adopting sustainability initiatives—including substantial economic returns for low-carbon investments, lasting market viability, competitiveness, and resiliency. 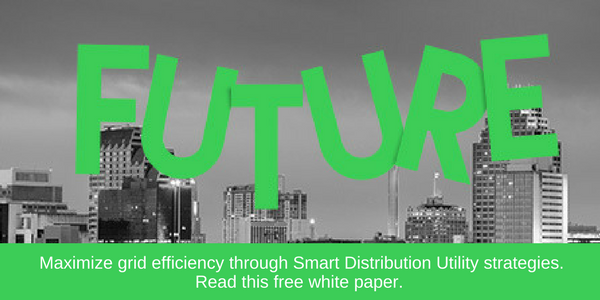 To learn modern strategies for leveraging smart grid tools that will help meet these challenges, get our free white paper: Smart Distribution Utility Strategies that Maximize Grid Efficiency.